Post Edit: I'm taking a day of rest-so I'll be back Monday. See you then. Welcome back to Cookie Bookie, the week long celebration of the sweet and the spooky. Follow along today and everyday by clicking the link in the upper left hand corner. Scroll down if you've missed Christie and chocolate, Austen and maple, or Noyes and candy corn. But why should grown-ups have all the fun? Today's Cookie Bookie is dedicated to the wee little ones. Today I'm sharing some of my favorite Halloween picture books and an adorable, easy to make cookie. 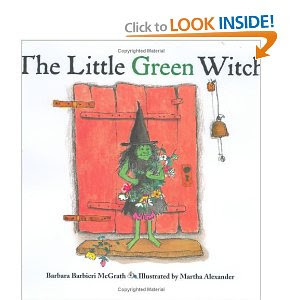 Let's get started with The Little Red Hen-oops, I mean The Little Green Witch by Barbieri McGrath. What should a pint-sized witch do when her lazy companions refuse to help her make pumpkin pie? She'll take a cue from the little red hen, eat it all up herself and cast a suprise spell of revenge on her feckless friends. 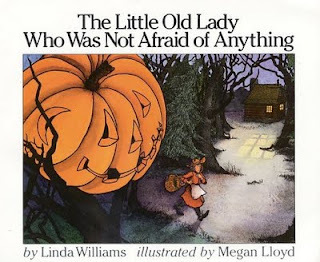 The Little Old Lady Who Was Not Afraid of Anything, by Linda Williams, is the tale of a lone woman pursued on a path in the dark of night . Gather up some random articles of clothing and turn this book into a reader's theatre. When you're done reading, you'll have a dandy scarecrow and only the mildest case of the shivers. 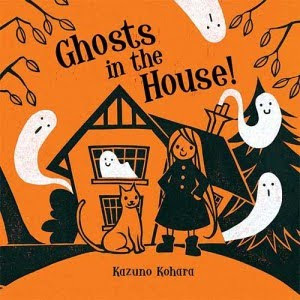 The darling illustrations in Ghosts in the House by Kazuno Kohara make it an inviting read, but it's the clever use for unwanted ghosts that make the book worth reading again and again. 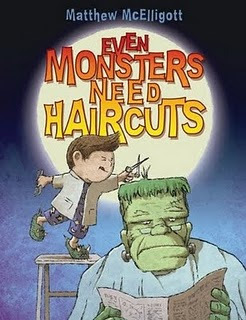 A new book, Matthew McElligott's Even Monsters Need Haircuts will delight the whole family with a clever peek into the minutia of Monster Life. Even ghouls have to wait in long lines (yawn!) to get their locks trimmed. 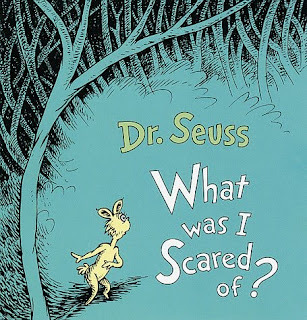 One of my favorite spooky reads comes from Dr. Seuss. What Was I scared of? tells the story of two dissimilar beings scaring the daylights out of each other. One of them just happens to be a spooky pair of pale green pants with nobody inside them. I followed the lead of my college buddy, Johanna Wagner, who memorized the entire book to recite to her siblings. I shared it with my little sisters Mary Kate and Catherine and then with my baby-faced nephews Jacob and Jordan. They're all grown-ups now (waah! ), every last one of them, so I tell it to my charges and they're starting to memorize it too. 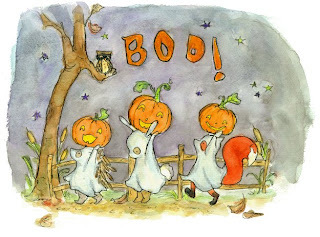 AND-I hope to be reading a Halloween book sometime soon from my supremely talented niece, Kit Chase. She just signed a lucrative book deal with Penguin Books, so maybe next year, I'll be able to feature one of her stories on Cookie Bookie. For now, if you want a shot at winning this oh-so-cute print, head over to her blog and leave a comment. Let's get started with our cookie today. These are an answer to a busy mother's prayer. I love making frosted sugar cookies with the charges, but let's face it: they take forever! The kids love it and want to make them for every holiday, right down to Arbor Day and Grandparent's Day. But I get tired of the mixing, the rolling, the cutting, the baking, the frosting, and don't even get me started on the dishes. Ay, mamacita. I spotted a tinted dough snowman recipe in a Taste of Home cookbook, and I doubted it would really work. It was worth a try, but I had my reservations. To my suprise, the cookies were fantastic. The dough has only five ingredients and mixes up in minutes. There are no eggs in the dough, so the tots can nibble as they go. Tinting the dough was simple enough with standard liquid food coloring. The charges had a blast shaping the dough into pumpkin shapes and beyond. Sailor made sweet little well-behaved pumpkins and West made feisty rabble rousers. Hey-I was having fun, too with a minimal amount of work. I was still nervous that the cookies would spread too much in the oven, or lose their bright colors with baking, but no! They were still bright, compact, and firm. And buttery-yummy, too. I have a feeling we'll be making these often. They're so fast that you'll have plenty of time to do the things you love, like read another spooky Halloween story with your little ones. In a large mixing bowl, cream together butter and sugar until light and fluffy. Add milk and vanilla and mix well. Add flour. Separate dough into desired portions and tint with food coloring. Shape into balls and flatten for pumpkins, or use your imagination to create other shapes and figures. Bake at 325 for 13-16 minutes on ungreased cookie sheets, or until cookies are set. Let cool for two minutes and transfer to a wire rack to cool completely. Tip: Use toothpicks to etch lines in the raw dough. Retrace the lines immediately when the cookies come out of the oven. Those look delicious and adorable! They seem like the perfect sweet reward to make with my kids tomorrow after their Sacrament Program. :) I just need to run out and get food coloring. Gigi-thanks for being comment number one. zero comments are the pits! Katie-you'll love these. They really work and they're easy. Amen! Eeee so cute! My kids are obsessed with food coloring, these will be a hit. Also, I have a question. There's a picture in this November issue of BHG of a pie. Oh my gosh what a revelation. The way they put the whipped cream on it was the coolest thing I've ever seen. Is there any way you could take a peek at it and in some future (near future I hope) post, teach us how to do it? It's on page 171. Adrienne-I've been obsessing over that pie-dying over that pie! I know how to do that kind of whipped cream; it's easy with the right tip but it has to be a big tip! I love those pies-they looks so masculine. They aren't little grandma pies, they are big strong man pies and they look utterly delicious! Um, my last comment seems to be full of double entendres, but it really is very innocent, I promise! Fabulous recipe! I love sugar cookies, but I hate all the work(and that the troops can eat them as fast as I bake them. Requiring a double batch, so that there are some to share)! These will be much faster and a ton of fun for the kids. I am a huge fan of kids books. I love to buy them or check them out of the library so that I can read them,of course, I'll tell everyone I got them to read to the kids. Do you think my 17 and 14 year old will mind if I read them a bedtime story? I love the fiesta rabble rousers! I bought some playdough cookie dough from a school fund raiser and we had a blast with it. I love to paint rolled sugar cookies too, but the pre-colored dough is so much easier. I am glad to have a way to make them on my own now. Oh, and the book deal! SO COOL! Her drawings are amazing. I am so impressed, and maybe a little bit jealous. How exciting! As I look back over my day, I realize I pretty much just do what you tell me. We went to the library and checked out "What was I scared of" (the glow in the dark version!) and then after grocery shopping, we made these bright buttery cookies. They are exactly what I've always wanted for roll-out cookie time with my kids. Easy, pretty cheap, yummy and wow so easy. We loved the dough, and the cookies held up to little hands pretty well. I forgot to add salt (typical), and while getting the food coloring mixed in the butter totally melted so the dough was pretty greasy once we were putting them on the pan. But no one cared. MK just mentioned to me that you had a fabulous replacement for sugar cookies and I have been hoping and hoping that you would post it, because I just realized yesterday that I don't have a pumpkin cookie cutter or any Halloween cookie cutters for that matter. So hurray and thankyou for posting this just in time for our family Halloween party, tommorow. Can I come over and spend the afternoon with your family? It sounds mahvelous! I didn't know there was a glow in the dark version! Extra spoooooky! Aw, Catte. I'm a little rusty. I would have to cheat and peek at the book! Thanks for remembering. I love the idea of memorizing and reciting that book! And this looks like the perfect cookie for us. Can't wait to try it. Keep the cookies and bookies coming! These would be fab in those cookie tins where you skip the cutting out part by putting the dough right into the pan! (The pan has different shapes for the cookies. Excellent post, went ahead and bookmarked your site. Can you please write more blog entries on this subject, its a request, because after reading your blog I am highly interested in learning more. This great blog is very interesting and enjoyable to read. The following tips tips are fantastic. Which i enjoy brainstorming about catchy subject lines. Often it can be challenging, but we need to do might know about want to do – please our readers!